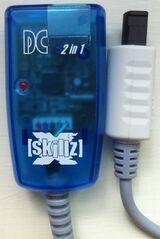 The Dream Connection 2 in 1 is a third-party accessory for the Sega Dreamcast created by Skillz. It allows the Dreamcast to interface with keyboards and mice using the PS/2 standard. Though similar devices exist from other manufacturers, most do not support both peripherals, i.e. a device is needed specifically for a PS/2 keyboard, and another for a PS/2 mouse.